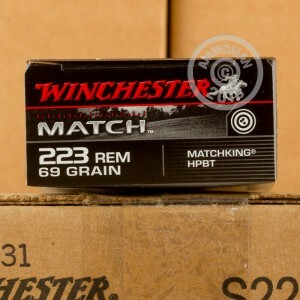 If you want to rise to the top shooting your AR-15 or other .223 Remington rifle competitively, use Winchester Match ammunition. While more expensive than typical range loads, this ammo is manufactured to a higher standard to produce consistent results and take full advantage of the shooter's skills. 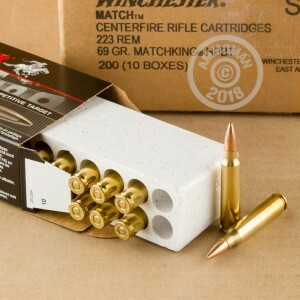 Each cartridge in this box of 20 fires a 69 grain Sierra MatchKing hollow point bullet. The MatchKing is a proven design that provides amazing stability in flight thanks to its boat tailed profile. This ammo is made in Oxford, Mississippi using non-corrosive Boxer primers and brass cases. 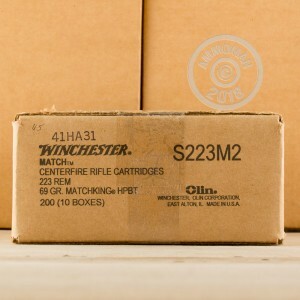 Push down the cost of match grade ammo with free shipping on AmmoMan.com--simply place an order for $99 or more to qualify.